The OSCxx-I0W Infrared Ceiling Sensor is a low voltage occupancy sensor that works in conjunction with the Leviton OSPxx Power Pack to control lighting. The sensor’s main function is to turn the lights ON or maintain the lights ON while movement is detected within the sensor’s range and to turn the lights OFF when the space is left unoccupied. 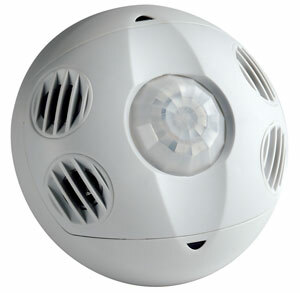 The sensor uses a Dual Element PIR heat detector that resides behind a multi-zone optical lens. This Fresnel lens establishes dozens of zones of detection. The sensor is sensitive to the heat emitted by the human body. In order to trigger the sensor, the source of heat must move from one zone of sensing to another. Nonmoving hot objects will not cause the lights to turn ON (like incandescent lights). • Fast, Simple Installation: Easy base mount, three wire connection (low voltage) and twist-and-lock detector attachment. • Self-Adjusting: Internal microprocessor continually analyzes, evaluates and adjusts the infrared sensitivity and time delay. Performance is kept at a maximum and user complaints are eliminated. • Flexible Base Mounting: Supplied twist-and-lock base mount permits fast alignment. Supplied cover hides mounting hardware and wires. Can be used with raceways for hard surface installations. • Range & Coverage: 450 sq. feet and 1,500 sq. • Maximum Reliability, Low Cost: All digital circuitry uses a minimum of components. 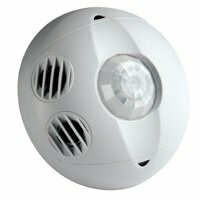 Large room occupancy sensor uses infrared and ultrasonic technology to detect people walking in and out of a room.